The Pope is to begin sending Twitter messages using the handle @pontifex as his personal account, the Vatican says. A spokesman said Pope Benedict XVI would "reach out to everyone" with accounts in eight languages, although no tweets were posted on the first day. In that time, the Pope's English account had accumulated nearly 280,000 followers, well ahead of his Spanish (67,000) and Italian (26,500) accounts. The first tweet from the accounts is expected on 12 December. At his weekly audience the Pope will be use a question-and-answer format for his first Twitter session, focusing on answering questions about faith in 140 characters. The Pope's tweets will also be posted in German (with the account generating 7,000 followers in its first day), Portuguese (10,700), Polish (2,650), French (5,000) and Arabic (2,150). So far, the Pope's accounts @pontifex - which mean "pontiff" or "builder of bridges" - are only following each other. The Vatican's Twitter account has almost 110,000 followers, although it follows no-one. Last year, the Pope sent his first tweet last year from a Vatican account to launch the Holy See's news information portal. "We are going to get a spiritual message. The Pope is not going to be walking around with a Blackberry or an iPad and no-one is going to be putting words into the Pope's mouth," said Greg Burke, senior media advisor to the Vatican. "He will tweet what he wants to tweet," he added, though the leader of the world's 1.2 billion or so Roman Catholics is expected to sign off, rather than write, each individual tweet himself. The Vatican has invited people to start sending in questions in advance for the Pope to answer in his first Twitter session. Other tweets are expected to highlight messages from his weekly general audience, Sunday blessings and homilies on key Church holidays as well as papal reaction to world events. The BBC's David Willey, in Rome, says that the Vatican has long shown interest in using the latest communications technologies to spread the faith with the inventor of radio, Guglielmo Marconi, setting up Vatican Radio in 1931. The Catholic Church also already uses several social media platforms, including text messages and YouTube, to communicate with young people. 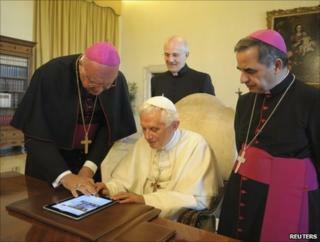 Papal aides say the pontiff himself still prefers to communicate in longhand rather than using a computer keyboard. Pope Benedict's six-year papacy has been bedevilled by poor communications. Embarrassing clarifications had to be issued over such thorny issues as his 2005 speech about Islam and violence, and his stance on condoms and HIV.